The 8th hole at Royal Troon, known as the Postage Stamp, is one of the shortest holes Tour players will play, but also one of the most treacherous. TROON, Scotland -- Welcome to Royal Troon, home of the Postage Stamp, and one of the most treacherous bunkers you'll ever see, as Rory McIlroy proved Tuesday morning. The pin-high bunker on the right side of the tiny par 3 (which plays about 125 yards), is very deep and tucked next to the green. With a steep face and little room to flight the ball, par from that sand is impressive. 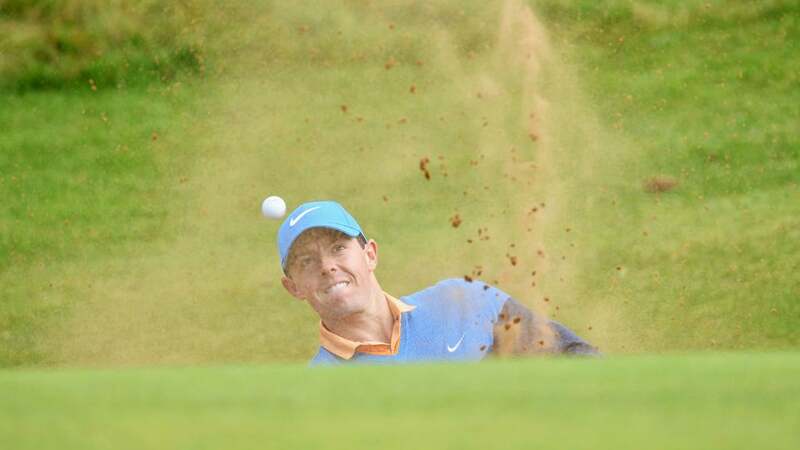 After a quick interview with Sky Sports, McIlroy found himself in that bunker, and his struggles were just beginning. His first shot caught the face of the bunker, bouncing back at him. His second attempt did the same. Much to the delight of his playing partners Andy Sullivan, Bernd Wiesberger and Matthew Southgate, McIlroy’s third shot escaped the bunker, but not the adjacent slope, running back into the pit. Nearby spectators groaned. His fourth shot caught the top lip of the bunker face and his fifth again found the slope and ran back to the sand. Finally, on his sixth attempt, McIlroy reached the green. Today's lesson: avoid the pin-high right bunker on the Royal Troon's 8th hole. McIlroy's adventure begins at the 5:35 mark in the video below.